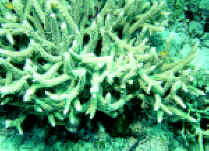 Acropora lamarcki (formerly corymbosa), Veron 2000. Colonies as corymbose plates up to 2 m across. Plates of short, upright branchlets that are more tapering upward. 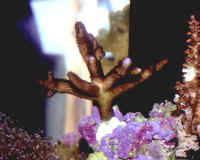 Axial corallites are exsert, tubular, with flaring outer lips. Red Sea images. Acropora lokani, Gili Trawangan, Lombok, Indo. 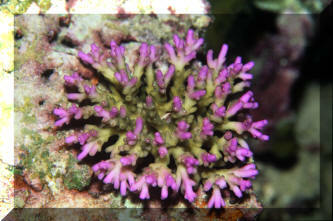 Umm, a purple Acropora monticulosa in Fiji... not air-brushed, I swear! 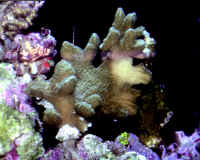 Acropora palmata, Elkhorn Coral. Found in the tropical West Atlantic. Established stands are 3-12 feet in diameter, with branches of 2-10 inch width. Occasionally "occurs" on live rock cultured for the trade. Pictured, a large stand in Belize and a budding colony in an aquarium. 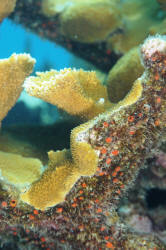 Acropora prolifera, the Fused Staghorn. Photos of a colony in Cancun, Mexico, and a "found" cultured specimen in captivity. This is actually a nomen nudum... a cross twixt A. palmata and A. cervicornis. 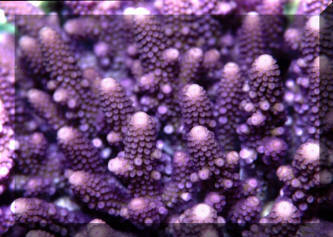 The last are the only valid Acropora species occurring in the TWA. Acropora robusta forms irregular colonies with thick, upward pointing branches. Much appreciated by hiding fishes and invertebrates. 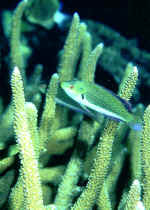 Acropora tenuis (formerly eurystoma) (Dana 1846). Colonies as corymbose clumps. Often with their fine branches evenly spaced. 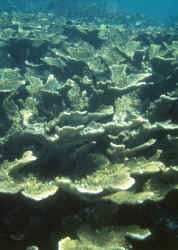 Corallites: Axial ones are long, tubular. Radial ones in neat rosettes with flaring colored lips. 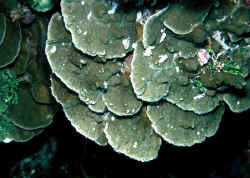 Common on Res Sea Rocky Reef Slopes. Above, left and below, the last captively propagated through fragmentation. This is a wide-spread Indo-Pacific species that generally forms large, even colonies in the wild. 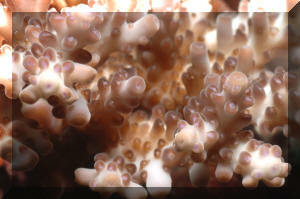 Above, left, and below are Acropora valida, the most widespread member of the genus, found from the east coast of Africa and the Red Sea all the way across the Pacific to the west coast of Central America. An adaptable and useful aquarium species. The last is a tank-raised fragment.